The holidays are a time for giving. In the Bay Area, they're also a time for learning. We've put together a list of the Bay's best science-centric holiday traditions, activities and exhibits. From riding a glowing gondola to the annual Christmas Bird Count, consider spicing up your holidays with a little science and nature awesomeness. For over 100 years, naturalists have been spending their holidays trekking through parks, mudflats and city streets to count birds. The ritual began in the year 1900, when ornithologist Frank Chapman proposed an alternative to the Christmas Day bird hunts that were popular at the time. By the turn of the century, conservationists were already concerned about declining bird populations. 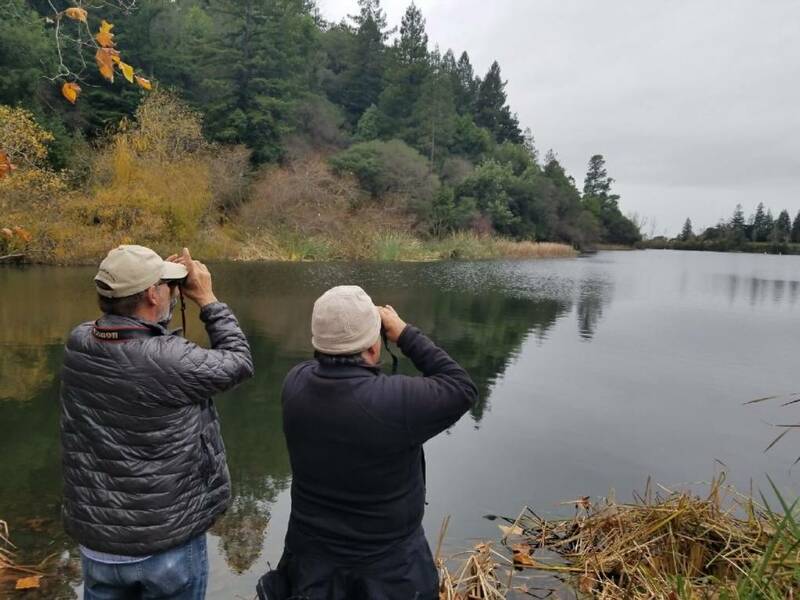 So Chapman and few dozen birders from Pacific Grove, California to New York City logged nearly 20,000 sightings across 89 species in the first bird-census of its kind. Through the years, holiday bird counts sponsored by Audubon have become a tool for scientists to monitor the health of bird populations and habitats. Data from the counts inform decisions made by the U.S. Fish & Wildlife Service. Christmas Bird Counts will be held in Monterey and San Francisco on Thursday, Dec. 27; in Sonoma Valley on Friday, Dec. 28; in Marin on Saturday, Dec. 29 and in western Sonoma County on Sunday, Dec. 30. Register here for San Francisco or find a Bird Count in your neck of the woods. The Exploratorium is hosting another of its "Curious Contraptions," exhibits, featuring mechanized sculptures called automata. This year's theme is fairy tales. The pieces are exquisite but they can also teach you about the basics of mechanical movement. "For instance when you play with the mermaid," says curator Nicole Minor, "you get a sense of these little cams and gears, and a little pulley system that’s moving her arms forward and backward, and her tail side to side." 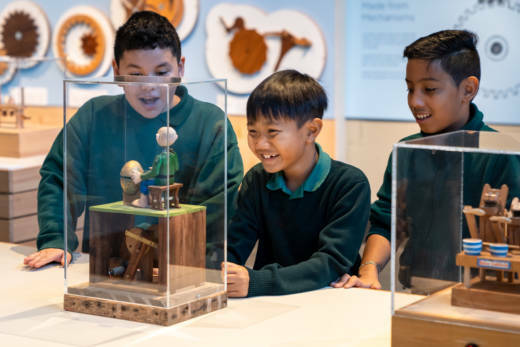 And, if you fall in love with automata, you can try your hand at making your own in the Exploratorium's Tinkering Studio. While you're there, check out Glow, an installation of fabulous light sculptures and creations. Open Monday, Dec. 24 10:00 a.m.–3:00 p.m.; Closed Tuesday, Dec. 25; Open Monday, Dec. 31 10:00 a.m.–5:00 p.m. Visit the Exploratorium's website for hours and tickets. Interactive exhibits reveal how polar bears, Antarctic penguins and other critters survive their frozen ecosystems. You can watch a presentation about the geometry of snowflakes from inside a theater decorated like a giant snowman. 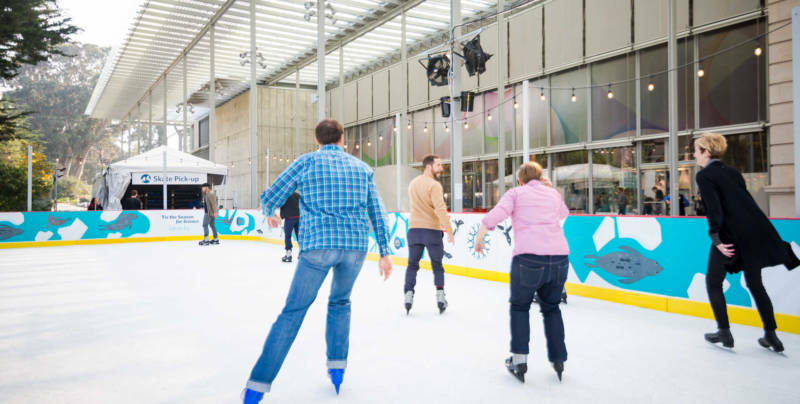 Skate times can be reserved ahead of time online or at the museum. Monday – Saturday: 9:30 a.m. – 5 p.m.; Sunday: 11 a.m. – 5 p.m.
Monday, Dec. 24 9:30 a.m. – 5 p.m.; Tuesday, Dec. 25 11 a.m. – 5 p.m.; Monday, Dec. 31 9:30 a.m. – 5 p.m.; Tuesday, Jan. 1, 2019 9:30 a.m. – 5 p.m.
Christmas trees are not the only plants that can light up this time of year. 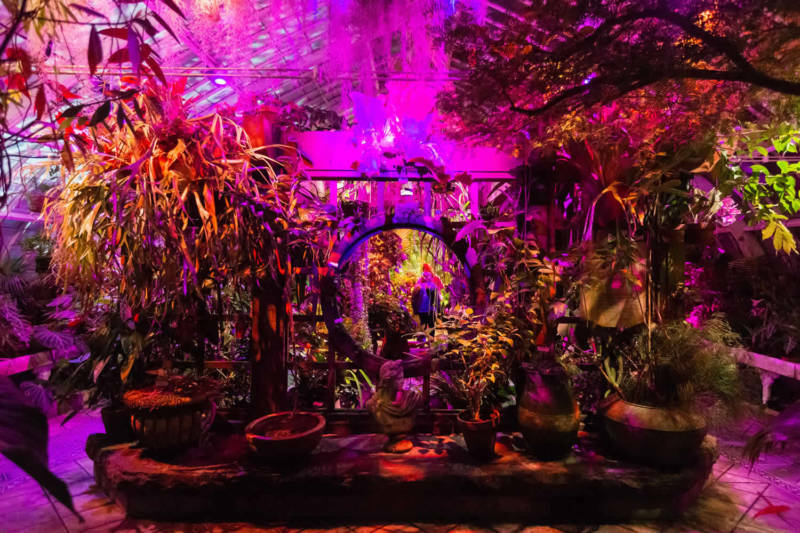 The Conservatory of Flowers opens after dark to illuminate flowers, ferns and other tropical flora with neon lights, prisms and immersive sound installations. Night Bloom is available on select evenings (5 p.m. - 11 p.m.). Tickets available here, but going fast. Kids 8 and under get in free. FAQ here. If you still haven't had your fill of dazzling light shows, head over to the Oakland Zoo for its nighttime extravaganza. Activities include a holiday sing-a-long with laser lights, taking selfies with pink flamingos and hanging out with Santa while snow swirls above the workshop. 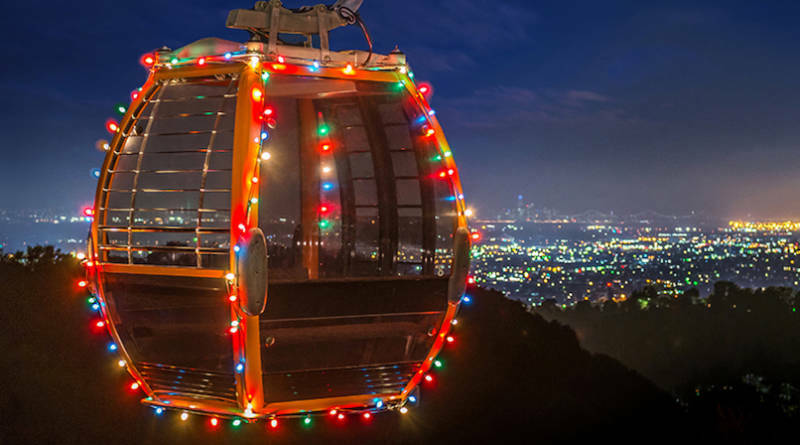 Then hop aboard a glowing gondola for sweeping views of the Bay Area skyline. Face painting and holiday craft activities are offered on weekends. 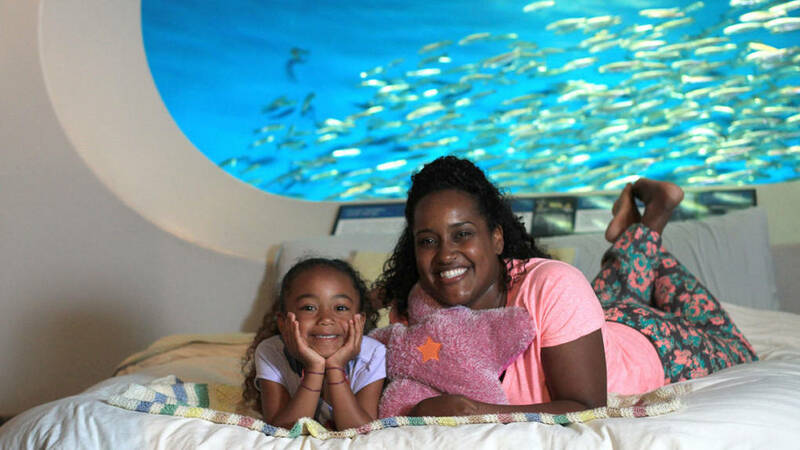 You and your kids can ring in the New Year with the fishes at the Aquarium's sleepover. Or, if you're sick of those retro Yule Log videos, cue up one of the Monterey Bay Aquarium's many live feeds while you sip eggnog. Choose dreamy jellyfish, cuddly sea otters, colorful coral reef ... or go all in for the Shark Cam. You can stream the live cams here. Oakland's Chabot is also hosting a kid-friendly sleepover party. The evening will include an introduction into famous scientists, planetarium shows and telescope viewing (weather permitting). And, if your little one wants to ring in 2019 but isn't allowed to stay up that late, Chabot celebrates the stroke of midnight by counting down to the New Year in different time zones across the globe. At 11 a.m., 1 p.m. and 4 p.m.,the colored balloons will drop. Activities for all age groups will occur throughout the day. Tickets and a detailed list of events are available here. The Tech is throwing its first ever Ugly Sweater Party. Come by in your ugly holiday sweater and receive one free child admission with every paying adult. Create your own custom cookie cutter, pop-up cards, gift wrap or buttons you can give as presents. Daily, 1:30 p.m. to 4:45 p.m. Paint your own Bio Ink snowflakes in this holiday version of our popular activity in our BioTinkering Lab. Harvest ink from a natural bio-pigment produced by living bacteria, then paint your own winter wonderland. Daily, 1 p.m. to 4 p.m.